1. In a small saucepan with a tight-fitting lid, combine the milk, ground ginger, cinnamon sticks, ground nutmeg, and star anise. 2. Using a mortar and pestle, roughly crush the cloves, cardamom pods, and black peppercorns. Add to the milk. 3. Over medium high heat, bring the milk to a simmer, cover with lid, remove from heat, and let steep and cool, about 10 minutes. Strain. 2. In a pot with a tight-fitting lid, combine the tea leaves, vanilla bean, and water and bring to a boil with the lid on. 3. Poach the plums in the tea for 3-5 minutes until fork-tender, then remove from the poaching liquid. 1. Combine spice-infused milk, eggs, melted butter, and vanilla extract in a bowl and whisk thoroughly. 2. Add the flour, sugar, baking powder, and salt and mix until smooth. Batter should be thick and fluffy, but if it is too thick and difficult to stir, thin it with a tiny dash of milk. 3. Oil lightly a medium hot skillet. Cook the pancakes slowly over medium heat, making sure that your skillet is always well-greased. 4. 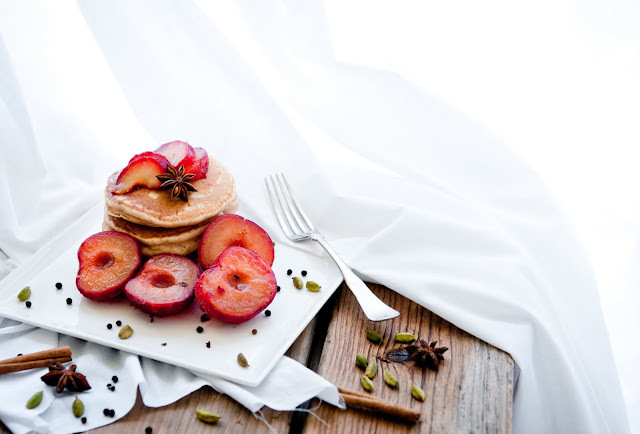 Serve pancakes with poached plums. I think I know what's for breakfast this weekend! These truly look divine, and the pictures, as always, are every bit as tempting as the recipe itself. Oooh, yum! This is definitely better then the oatmeal I had for breakfast! I think I'm going to reverse your idea and have breakfast for dessert :D Thank you for the recipe! Wow! I love that you used flavors so unexpected for pancakes. How strongly does the tea affect the flavor of the plums? Is it just a hint of tea or is it easily identifiable? 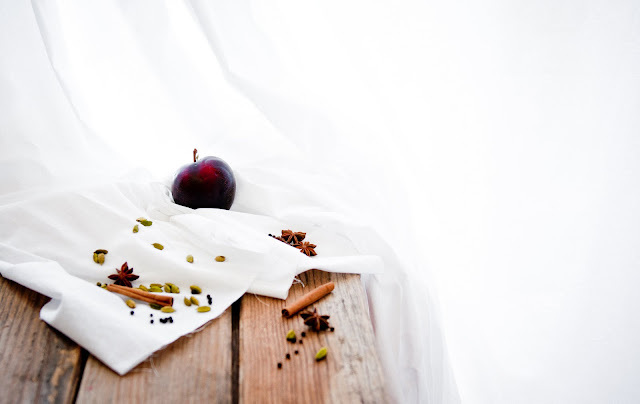 lovely idea to poach the plums in tea with those spices!! mmmmm.. i can smell it!! 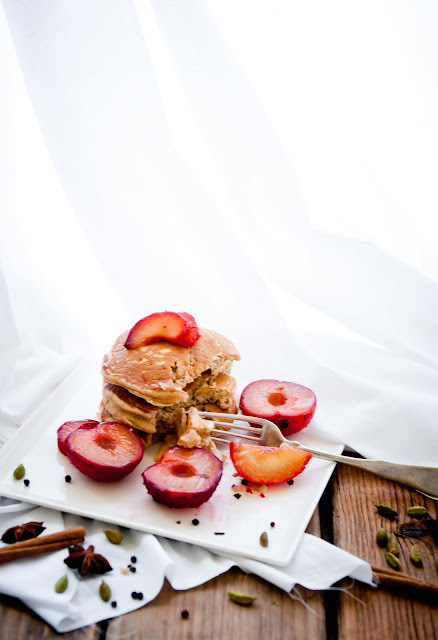 Chai pancakes and plums? What great flavors -- sign me up! And I totally relate to having one of "those days." Except I think it's been that kinda month here haha. Beautiful photos, I love the light! And anything chai flavoured is an awesome treat in my books. Very nice recipe. I was reading this while eating egg whites with turkey and now feel so unsatisfied...ha-ha. I am totally going to make these pancakes, they look incredible! Your pictures are beautiful. Great meeting you on Twitter and I am looking forward to reading more! Hi my dear! I'm so sorry I haven't been lurking around your blog lately, I've just been so busy. 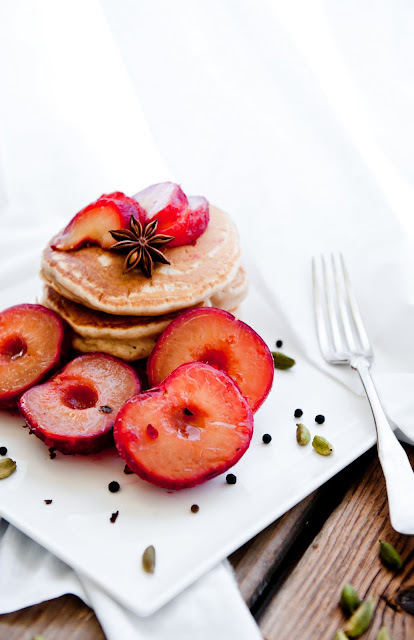 I really love the idea of putting pepper in the pancakes.. something I haven't tried but will have to! 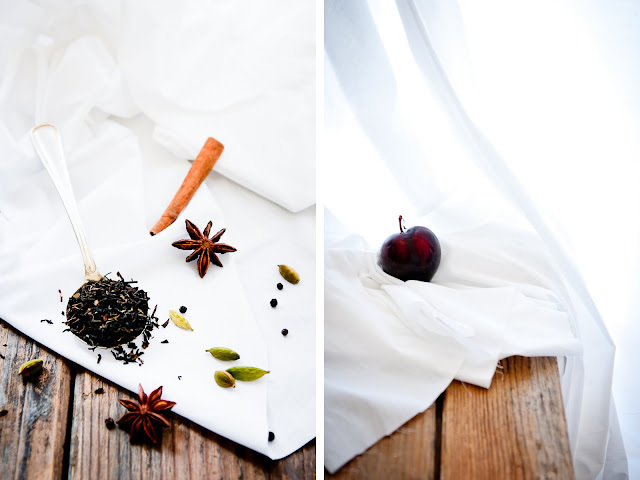 @ApplesandOnions: the tea doesn't really affect the plum taste much, just lends it a hint of darkness and muskiness. @Xiaolu: hope your month gets better! Hope your hand is better. Just curiously do you have all these spices lying around your kitchen or do you actively go out and just amass them on whim? @Iris: hehe, I know what you meant, but you got me thinking that pancakes (perhaps savory ones?) that feature pepper might be interesting to think about. I have a friend who's been trying to get me to use black pepper in a dessert for some time now! As for the spices, I have a fairly well-stocked kitchen (too well stocked if you peak in my pasta cabinet! ), so I have most of these things on hand, especially because I like adding random flavors together on a moment's notice. I did have to go out and pick up some star anise and black peppercorns for this recipe, though. wow girl this looks so yummy! I love pancakes and these look amazing!! 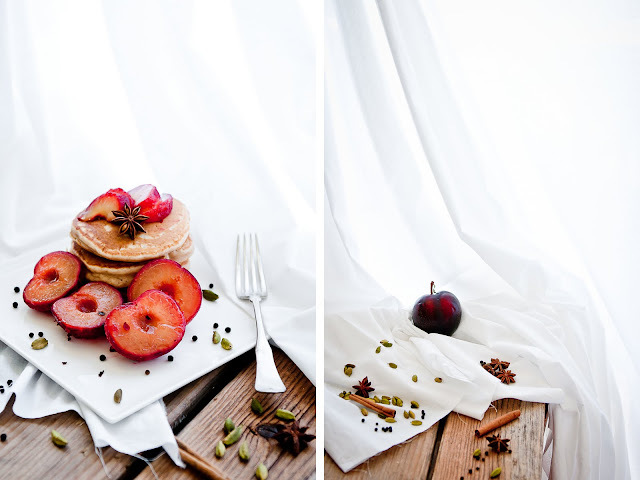 wow I just love it, so well capture and defintely a hit pancake, I like the use of black tea too! brilliant! This is very yummy! Everyone at my house loved it! :) Instead of throwing out the tea the plums are poached in though, I started with the tea in a tea ball, and made a sauce with the remaining tea using honey, agave nectar, and a thickener. This has definitely made it into my selection of regular recipes! @Anonymous: So glad that you liked this, and your tea and honey sauce sounds wonderful!